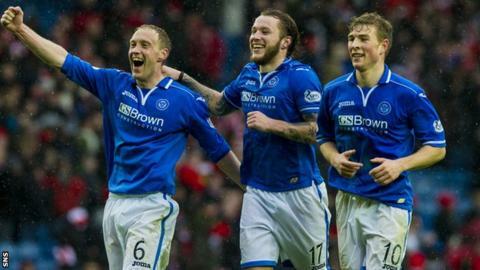 St Johnstone came back from a goal down to beat Aberdeen 2-1 at Ibrox and reach the Scottish Cup final. Here BBC Scotland pundit John Robertson gives his marks out of 10 for the Saints players who secured the club's first ever appearance in Scottish football's showpiece. And fellow BBC Scotland pundit Willie Miller, who played and managed the Dons, gives his ratings for the Pittodrie men. Made a fantastic save from Adam Rooney at 1-0 to keep Saints in the game, and produced another good stop from Barry Robson at 1-1. Immaculate handling throughout. He led by example all afternoon in a typical no-nonsense display from the Perth skipper. Produced a really solid display at the heart of the defence and gave the Dons forwards very little room to manoeuvre. Dependable defensive showing and worked well with centre-back partner Wright. Steady performance and always looked to get on the ball and drive forward when he could. Absolutely tireless in midfield and grafted really hard to give St Johnstone a foothold in the game. He battled away to ensure St Johnstone had the chance to compete in midfield. The former Hibs man really came into the game in the second half and got forward to support the front-men effectively. A very lively display. Always wanted to drive at the Dons defence and cause problems. Superb link-up play all afternoon, particularly at the second goal. Man of the match second-half performance. Two superb finishes to win the tie and seemed happier coming in from the flank. Saints' talisman yet again. Thrown on to shore things up for St Johnstone. Made one very good save from Stevie May in the first half and had no chance at the St Johnstone goals. Tried to get forward at every opportunity and was sound defensively, but when May went out to his flank in the second half he was less effective. He was given a hard time by the two St Johnstone strikers and both goals came through the middle. The skipper has had a great season but this was not his best game. He had a tough time up against the pace of O'Halloran, and was also given lots of problems by MacLean. Not as effective as he has been this season. O'Halloran's pace ensured he had an uncomfortable afternoon. Had one of his quieter games, although he still got around the pitch pretty well. Tried to engineer some shooting opportunities. He was quite influential but not as much as in previous games this season. Provided a great delivery for Niall McGinn, who should have scored with a back-post header. He always plays with his head up and tries to pick out passes, but he had a quiet afternoon. Did very well to set up the Aberdeen goal in an effective first half. His pace is always a real threat but he fell out of the game after the break. Great finish for the goal and is always a danger, but he was quiet in the second half and missed a great chance to make it 2-1. The striker worked hard and didn't always get the service he needs. Failed to beat Mannus when he was clean through on goal with the chance to make it 2-0. Came on late to try to get an equaliser but he couldn't influence the game.